Wild West Outfitters ? Specializing in trophy Utah elk hunts on Mt. Dutton. 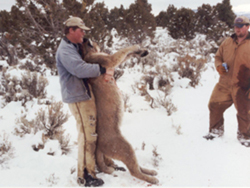 They are also offer hunts for deer, cougar, and bear across southern Utah. 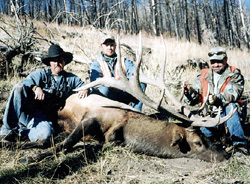 Wild West Outfitters is a small family oriented outfitting business that operates on several of Southern Utah?s top producing elk hunting units. Their specialty is the Mt Dutton unit where they take several hunters each year. They employ horses where ever necessary to access remote camp sites and to carry your trophy once it is down. This option is essential for the areas they hunt on the Mt Dutton unit. Due to the fact that they live right between Mt Dutton and Panguitch Lake and are only a short drive from the Plateau Boulder and Paunsaugunt, they are able to scout each area all summer long. By the time your hunt begins, you can count on them to know what the trophy potential is for that year and where the biggest trophies are hanging out. Anyone familiar with the Mt Dutton unit of southern Utah knows that it has produced some giant bulls and Wild West Outfitters has helped their hunters to a good number of them. Living in the shadows of Mt Dutton provides Kyle and his guides the prime opportunity to spend a substantial amount of time each year preparing for the fall hunts. The Panguitch Lake, Beaver, and Paunsaugunt units are also very close to home and they can be scouting either of these areas in only a few minutes. All of these units have produced some giant bull elk over the years. Wild West Outfitters even guided a hunter to the Utah state record muzzleloader bull a few years back which scored over 420". They also run dogs for cougar and black bear on these units and a couple surrounding areas as well. Although their main focus is on elk and cougar, they are also prepared for deer, pronghorn, and mountain goat. The Paunsaugunt is well known as a trophy producing unit for mule deer and it holds some exceptional pronghorn as well. The Beaver unit is famous for giant bull elk, but also has a growing reputation for producing record quality mountain goats. Wild West Outfitters maintains a very high success rate for all species and their professionalism and service receives high praise from their clients. If you have been drawn for one of the trophy bull elk hunting permits for either of these units, or are looking for a top notch outfitter for a mule deer, bear, cougar or mountain goat hunt, Wild West Outfitters has the knowledge and experience to help insure that your long awaited Utah trophy hunt is a success. Check out their website at Wild West Outfitters or contact Hunters Trailhead for more details.